Now the question is what photo booth software to choose? The photobooth software very important component of the photobooth. It will define your future photo booth business in many ways. We designed our own touch screen photo booth software from initial concept to current version by implementing a feedback from the customers who used the photo booth at the events. Surprisingly the customers did not appreciate some "cool" features that we thought are necessary to have in the photo booth. 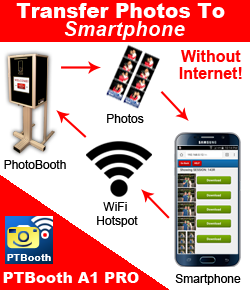 The initial idea of this article was to persuade the readers to buy our photo booth software PTBooth by providing the information and comparison with the other photo booth software available. But we decided not to do that and give you the opportunity to make the choice without any pressure. The photo booth software has two side: one is the side that photo booth builder deal with and second is the side that photo booth visitors deal with. Both sides are equally important. From the photo booth builder point The photo booth software is the component that affects at least 4 other components in your photo booth such as camera, computer, printer, monitor (partially). 1. The photo booth software supports a particular camera that you have in mind or already have the camera in possession. Or perhaps you should choose the camera based on the fact that the photo booth software of your choice is supporting that camera. 2. The photo booth software supports a particular printer that you have in mind or already have in possession. Or perhaps you should choose the printer for your photobooth based on the fact that the photo booth software of your choice is supporting that printer. 3. If you are planning to use a button or external switch make sure the photo booth software support that device. 4. What photo booth software features would you like to have. 5. What is photo booth software system requirements, because it will define your choice of the photo booth computer. 6. Will you be able to receive photo booth software support and customer service by phone, skype, email or other means in case you need immediate assistance. 8. Will you be able to customize the look of your software (what the photo booth visitors will see). The photo booth software price range from $59 to $700. Simply search " photo booth software " and explore what is out there. We hope this article will help you to make sound decisions when it comes to buying and using the software for your Photo Booth.